I’m jumping on the Throwback Thursday bandwagon. My friend Kari has been doing on her blog and it has been fun to see her old photos, so I thought I’d try. Plus, it gives me an excuse to use up some of the 37,000+ photos I have uploaded on my photo page (yep, 37,000+). Since it is fall, I went with a football themed picture! This is a pretty typical group picture of some of the 420 crew. It is from left to right: Anna (Anna Mazurek Photography), Gail, Me, and Rach (Out of Meal Ideas). Typical. Anna chilling with a beer looking on at the shenanigans. Gail and I involved in the shenanigans. Rach with a smile on her face that is saying “what the heck are they doing? take the picture already.” Oh, and there is a garden gnome involved. Our group has a thing for garden gnomes, I don’t know how it developed, you all have no idea how hard it is for me to not buy a “hanging with my gnomies” shirt every time I see one. I love this picture. I actually think I have it framed somewhere. 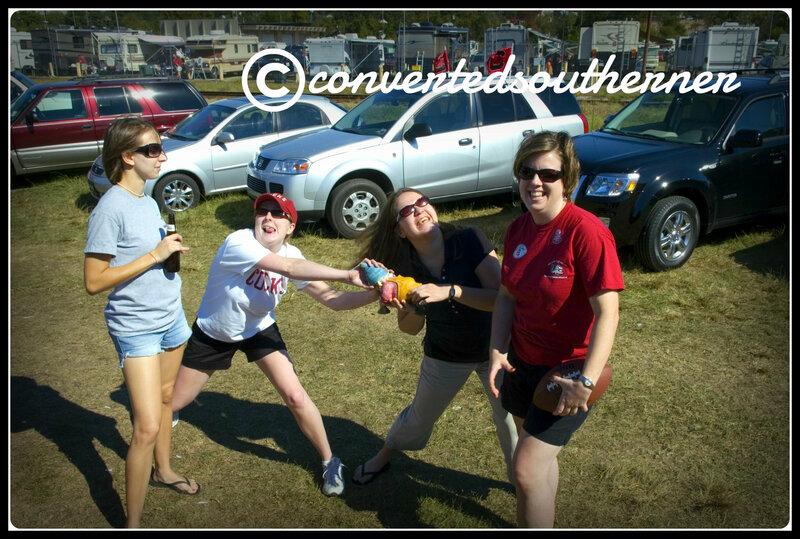 It was a beautiful fall game and we had all gotten together to tailgate in the morning for before a game. There were football shaped biscuits and chicken sandwiches from chic-fil-a. It was a perfect way to spend a Saturday in the South. Food, friends, college football and tailgating. I’m pretty sure that there was a ride on a motorized cooler train after this…. *I should note that I THINK this is my photo, but I’m not 100%. So if it belongs to Anna, Gail or Rach… sorry. I had to dig to find it. It is a fave though!